A student studies for the PSAT with an official practice test. 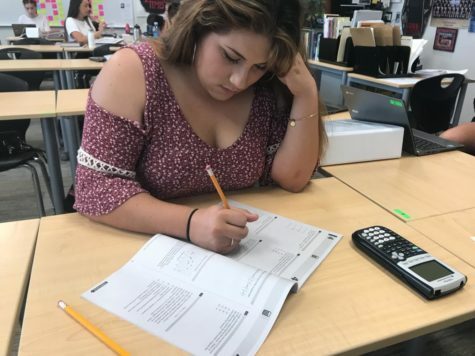 On October 11th, freshmen, sophomores, and juniors all over the Capistrano Unified School District took the PSAT/NMSQT, which is less commonly known as the Practice Scholastic Aptitude Test, or National Merit Scholarship Qualifying Test. Many students thanked their lucky stars at the news of a minimum day, but some juniors buckled down and began studying in hopes of being one of the select few to qualify for the acclaimed National Merit Scholarship Program. The PSAT is a beast within itself. Essentially, it’s a practice test to help develop a student’s test-taking skills and intellect before they take their other college entry exams, the SAT and ACT. It has four sections, which are taken over the span of just over three hours: reading, writing and language, math without a calculator, and math with a calculator. In past years, students had to pay a fee for this valuable experience and schedule it on a weekend. Last year and this year, however, SCHS students have been fortunate enough to take their PSAT for free and on a school day. The National Merit Scholarship Program actually has three different scholarships. One of them is the National Merit Scholarship, which is the most prestigious and well-known. The other two scholarships are the College-sponsored Merit Scholarship and the Corporate-sponsored Merit Scholarship, which both offer cash rewards students can allocate towards their college education. While freshmen, sophomores, and juniors can all benefit from practicing their essential academic skills on this test, only juniors can qualify for these exclusive scholarships. To actually win a scholarship, one must be in the top 1% of scores. Approximately 50,000 students score high enough to qualify for this elite opportunity. Of these 50,000, around 34,000 students are sent a letter recognizing them as commended students. From this original 50,000, 16,000 students are then notified that they’ve become semifinalists. Another 1,000 students are eliminated, and 15,000 students are told that they’ve moved up to the finalist standing. Finally, 7,500 students are granted the National Merit scholarship after an intense deliberation. This competition singles out this final group from the initial 1.6 million entrants and recognizes them as some of the most accomplished student minds in the country. So if a student wins this scholarship, it’ll beef up their college résumé. So,which students at San Clemente High School are vying for a spot amongst the best of the best? The PSAT/NMSQT was undoubtedly a big event at SCHS. As students arrived in their testing rooms with No. 2 pencils sharpened and ID cards at the ready, little did they know they were taking another step toward their fast approaching college futures.